Earlier on this year Academy student Thomas took a 5 day NCFE level 4 course in locksmithing. In this guest blog post Thomas talks about his experiences, skills and knowledge in locksmithing of which he has gained whilst taking a course at the Keytek® Locksmith Training Academy. 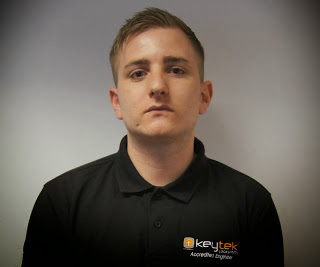 “After recently completing the Keytek® Academy course I was very impressed with the extent of the skills demonstrated and aspects of the industry that are covered within the week. I came to the academy with little to no knowledge or skills in locksmithing and carpentry. The techniques shown by the course trainer were a great starting point and simple enough for me to understand. The course content itself included techniques that would be needed for both lock fitting on site and upgrading a customer’s locks to British Insurance Standards. This demonstrated to me the importance of fitting parts that will be in compliance with a customer’s home insurance. The course content covered the fitting of a wide range of locks, the destructive and non destructive methods of entry including uPVC mechanisms and wooden doors and how they operate. I left the course feeling that I could happily start working within the locksmithing industry with a great overall understanding of the trade, which has helped me to complete jobs for customers with confidence.